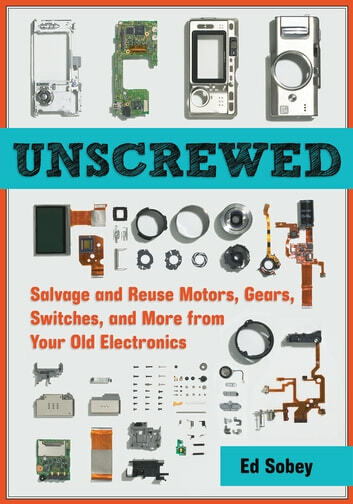 Perfect for the do-it-yourselfer, this handy guide to household electronics gives the weekend workbench enthusiast a multitude of ideas on how to salvage valuable parts from old electronics and turn them into useful gadgets once more. 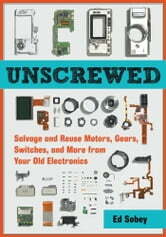 This handbook is loaded with information and helpful tips for disassembling old and broken electronics. Each of the more than 50 deconstruction projects includes a treasures cache” of the components to be found, a required tools list, and step-by-step instructions with photos on how to safely extract the working components. Projects include building a desk lamp from an old flatbed scanner, a barbeque supercharger from a Dustbuster impeller, and a robot from the gears, rollers, and stepper motor found in an ink-jet printer. Now, old VHS players and fax machines will find new life with these fun ideas.